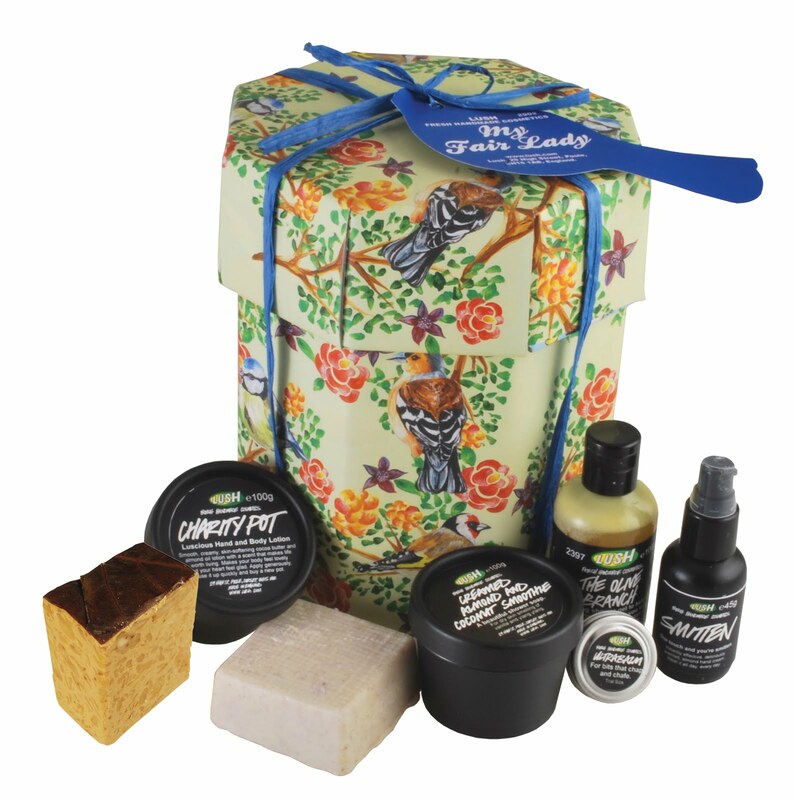 A gorgeous hatbox full of Lush’s most luxurious products, including whipped Turkish Delight body polish made with real Turkish roses and super skin softening shower gel The Olive Branch made with real olive oil. This delightful gift is the perfect pamper treat perfect for any fair beauty. Includes: Smitten Hand Cream, The Olive Branch Shower Gel, Creamed Almond and Coconut Smoothie, Buffy Body Butter, Charity Pot Body Lotion, Figs and Leaves Soap and Ultrabalm trial size. Simply leave me a comment telling me which is your favorite LUSH product, simple! Unfortunately, I don't have a favorite LUSH item as I've never been able to shop there. I don't have a store near me and I like to try/smell items before I buy them! I love the butterball..that vanilla swizzle in ur bath is just mmm so lush!! I've actually never used a LUSH product before. Shocking, I know. I haven't been able to try it. I can't find it anywhere and buying online I have to pay the extra shipping and handling and I just don't have that kind of money to fling. That's such a terrific giveaway! I lovelovelove 'honey i washed the kids' soap. Smells good enough to eat. Hello! I did not test any products from Lush, but I love to try from tonics, cleansers, shampoo, etc.. I would love to participate! I post from Spain, i don't know if i can enter. I just started to follow your blog and can I say I'm in love. My favourite Lush product would be Honey I washed the kids soap. It smells devine!! Hi thanks alot for this great giveaway your haveing atm i havent tryed LUSH for my self but i would really like too try them out for my self!! I've only tried the Godiva Shampoo Bar but i LOVE IT!! I've never tried any Lush products before but I would love to try some. I've heard of it here and there but really haven't had a chance to try it out. Thanks for a giveaway. Thank for this giveaway! My favorite Lush product has to be the Dorthy bubble bar. Great giveaway. My favourite is rock star soap - I love the smell! and good luck for the dream job! my fav lush product has to be snow fairy. when it comes out during the christmas time i do my best to stock up! Mange Too massage bar!♥ I absolutely love it although the smell of Rock Star is lovely too! My favourite Lush product is the Comforter bubble bar by far! I love Honey I Washed The Kids soap, great giveaway! Lush dream cream is amazing and smells so nice!!! Flosty Gritter, though that's been discontinued to the comforter bar or rockstar soap! Hi Suzi ^_^ Thanks for the giveaway! My favourite product is the bubblegum lipscrub. Favourite has to be Olive Branch shower gel!! Oh and the patchouli in Blue Skies too, sorry am cheating now. I LOVE rockstar soap - amazing smell! I have my fingers firmly crossed for this so that i can try out some new things! Oh...I did not use it before, but I like the smell!! !I love all the soaps!! Unfortunately never used any products from Lush, but I want to try the Tea Tree toner and Ultra Blend Cleanser .. I hope to win! And good luck to all! Kisses... and thanks for this amazing Lush giveaway!! My favourite lush product is grease lightning, it really saved my skin!! My favorite lush product would be the T Tree Toner Tabs. It's really amazing I've tried a lot of acne products but it didn't work that well as this one did. So, it's very good to tighten the pores and prevent acne. It's suppose to use it to steam the face but I think it's a waste so, I pour the green liquid into a spray bottle and use it that way and it's cheap as well. My favorite lush product is definitely the bath bombs! I haven't tried one that I didn't like yet. Thanks for the giveaway! I have never tried any Lush products, although I have really wanted to try them before! i voted on your VERY(was it?) on the day you first announced and i hope youll make it as the1st place!!!!!!!! my all time favorite lush product is the "angel on bare skin". it really clears my skin and keeps it soft. Wow! Thanks for the giveaway! I never tried lush product before. But really wanted to try it! The were no lush store in my country. I heard a lot about lush in youtube. I love The Lush Dream Cream my fav body lotion!!! i've seen more then tons of review about lush but unfortunately i couldn't buy them coz they are not available in my country (India) i would love to try them if I cud get them from anywhere. My fave product of Lush is the Dark Angels Cleanser. Hope you get your dream job! Thanks for an amazing giveaway!! HI suzi! love your all vids and blogs so much! and also thank you for the giveaway! I've only used the green foot scrub! but its fab! Hi Suzi, my favourite product would be the Celestial Moisturizer. & also thanks for the giveaway. My favourite Lush product is the Rock Star soap! But I would definitely try out the body butters. I never use lush before this is probably my first time hearing about it but I do now plan to use it in the future! My favourite would be the bubblegum lip scrub!! I love all their shampoo bars ! hi suzi. theres no lush in korea and thailand so i dont have my favorite product :'( (havent even tried one product!!) so i wish through this giveaway i can get a chance to try out lush products! thanks for the giveaway suzi! have a good day! My favourite product has to be The Olive Branch shower gel - it's gorgeous! My favorite lush product has to be the Dream cream, unbelievably soft and very soothing! smells ridiculously yummy too! you rok for the fantastic giveaway and i really hope i can win this! My favourite Lush product has to be Bubblegum Lip Scrub!! My favourite LUSH product is the karma bubbbble bar!!!! I love anything "karma"
Oatifix mask is my favourite, it's super thick but it is just WONDERFUL. i never trie it,but i always forgot to check out the lush store. haha so thanks for the giveaway! I love the Snow Fairy shower gel that they only bring out at Christmas. I have stretched my bottle out 7 months!!! my fav product is mint chocolate mask! I have been following you since a couple of weeks now on youtube and decided to go and buy the beauty diary masks the other day! I also had a blog a year ago about clothes, and just decided to start a new one! Check both of them out!! Hi Suzi, thanks for the Lush giveaway!!! My all-time favorite Lush product is their Herbalism facial cleanser. it does amazing things to my skin!! LUSH's porridge soap has the one scent that I find to be sweet, soothing but not overpowering. Thanks for extending the giveaway to us and I have my fingers crossed for your "dream job"! hey suzi!! My favourite product is the bubblegum lipscrub. i love 'angels on bare skin', it leaves your skin feeling so soft and nourished! Can't live without tea tree water too! I love the dream cream body lotion!!! :) It smells great and i have dry skin. It's a really nice product. But i cant afford it continuously. my very first lush item daddy o shampoo that i got from my dad. Hi Suzi, thank you so much for this wonderful giveaway..my fav lush product would be probably 'Honey I washed the Kids'. I love love that soap!!! I loved the christmas products this year; especially cinders! i really love the sugar lip scrub!! thats the only product i have used...and it is the only brand that does such type of scrub!! I LOVE their bath ballistics, my two favs are fox in the flowers (a really delicious fresh sent) and Sakura. I'm absolutely in love with their bubble bars! !